This eye-catching, responsive website, designed and developed by DDA, allows CHECKredi to present the many features of the Clover POS, while exhibiting their ultimate service and support. CHECKredi, a long-term client of DDA, has been integrating a powerful, state-of-the-art point-of-sale system into their selection of payment tools, and they wanted an informative website that matched the uniqueness of this technology. DDA’s goal was to design and develop a stunning responsive website that users can view on any device, from desktops to tablets and even smartphones. Through this site, users can learn more about the endless possibilities offered through the Clover POS along with the support needed to transition to this new system. With the help of dedicated in-house graphic designers, programmers, and copywriters, DDA created a striking resource for users to educate themselves about Clover POS and the POS services CHECKredi offers. The design of the website complements CHECKredi’s Clover brochure, also designed by DDA. The navigable menu allows users to easily find the information they are looking for. Customized imagery is featured throughout the site, giving it a modern look. An extensive App Market section shows the numerous apps available for users to customize tailor and enhance Clover POS equipment. 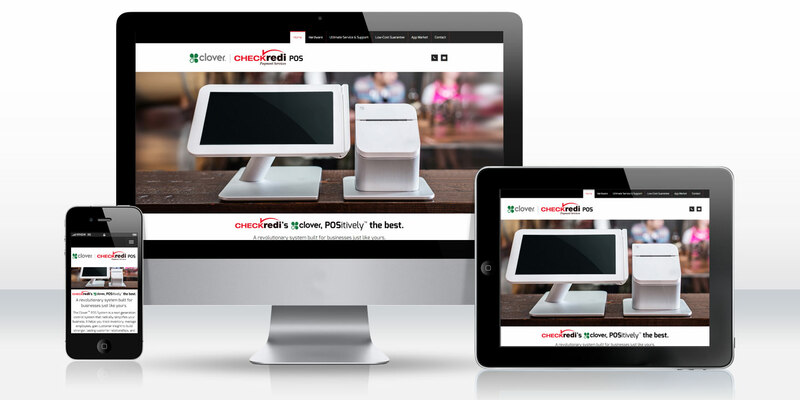 CHECKredi now has a website that highlights the Clover POS and its vast possibilities. Users can easily understand that CHECKredi offers a low-cost guarantee along with all-encompassing support, from setup to training and beyond.